Here's a card I made for my Sweetie. I was in such a rush to publish this card and run off to have dinner with my Sweeties that I didn't have time to finish this blog post. 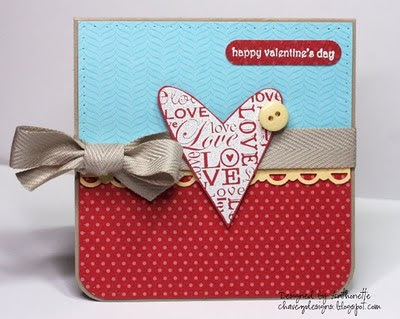 Everything on this card is Stampin' Up, except for the Martha Stewart twill tape and Making Memories button. This card is for two challenges: CPS Sketch #153 (which was sponsored by Papertrey Ink) and Two Happy Stampers Color Challenge #1. The sketch and colors were perfect for a Valentine's Day card. I still need to create a card for the Little Guy. 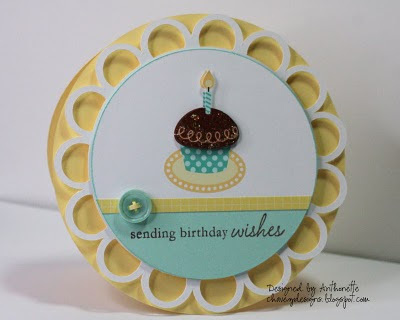 Here's my last card as a Guest Designer for Inkspirations by Makeesha Byl. Thanks so much Keesh for the many weeks of challenges! I've never had a guest designing gig before, so this was very thrilling for me. Tonight I received some new goodies from SU!. I had to use my new stamps and border punch. 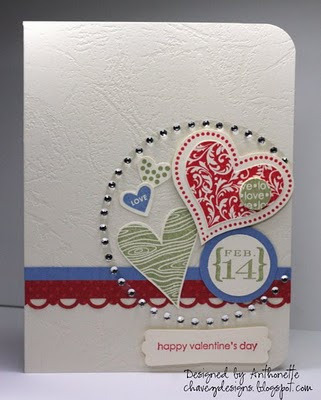 The creative mojo was not flowing, so I had a very hard time even though had great colors, stamps, and new tools. I think I'm just worn out from a very long week. Next week the little guy doesn't have school, so it will be fun to not have the routine of school. It's super late here, so I'm not going to post an ingredient list for this card. Thanks for stopping by, Chicas! I'm almost embarrased to post this card. I don't like it very much. It's like distressing gone wild. Yikes! The only part I like is the lace border I cut with my Silhouette. I loved the sketch and colors for Papertrey Ink's "Paint" by Number Sketch challenge. Well, tomorrow is another day. I'll have another try at this sketch at another time. Have a good one and thanks for stopping by! I haven't done the embossed resist technique for a very long time and it shows! Haha! I used the technique tonight and I'm not in love with what I made. I do love the new lace border I cut with my Silhouette. 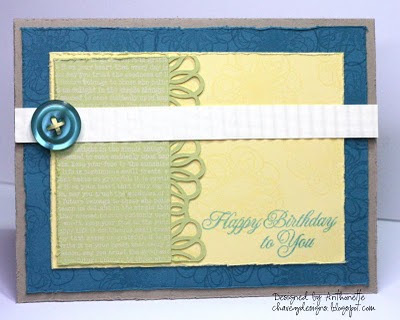 I created this card for Papertrey Ink's Day 5 Anniversary Celebration, where we had to use a form of embossed resist. 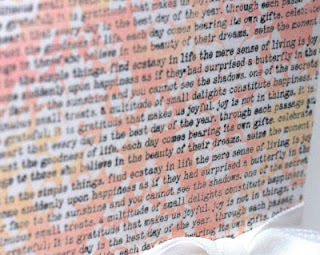 My job as Guest Designer for Inkspirations by Makeesha Byl is almost over; it's been fun. I made this card for my Aunt Ruby who lives in New Mexico. She loves receiving cards. Her health is poor. She's been living with Parkinson's disease for several years. This week, Keesh gave us Sketch Challenge #18. I find sketch challenges harder than color challenges. 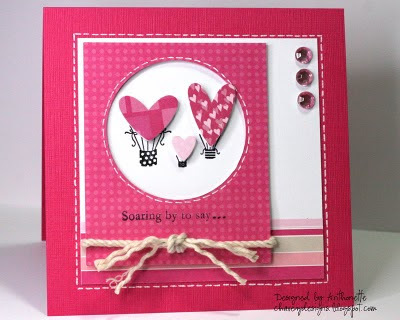 I love how this card turned out, except the "Soaring by to say..." sentiment is not stamped as dark as I would like. I forgot to take a picture of the inside of the card, but it says "Happy Valentine's Day". 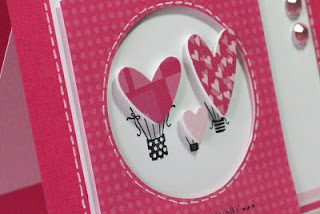 This is my first time using the Everyday Button Bits set from Papertrey Ink. I didn't use buttons, but I created chipboard using the 3 Heart Punch from SU!. 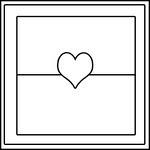 I also masked off a word on the sentiment to make it fit my Valentine's Day theme. I've been a fan of Papertrey Ink for a while now. How can you not be, right? Nichole is having a huge 3rd year anniversary celebration. I had to join in the fun. 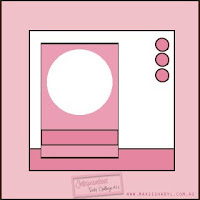 I used the cupcake image from Heather Nichols. I printed two images out and cut the top off of one of them and coated it with Stickles. I used some foam tape to mount it on the first cupcake. This is the first card I've made that is almost entirely Papertrey Ink.